The Creagh/Carr Review gives you the best of both worlds - the opinions of elderly hackette Bev Creagh and those of ace young reporter Stewart Carr. They’re often in sync but they had very different views on Aladdin, this year’s panto at MK Theatre. CREAGH SAYS... Sheer genie-us - that’s the only way to describe Aladdin at MK Theatre. OK, there were lots of corny jokes and some dodgy innuendoes but hey, that’s panto for you!! And I must admit the child in me just loves this annual Christmas tradition with its magic and mayhem. And Aladdin doesn’t disappoint - there’s a flying carpet, spectacular effects and an enchanting troupe of children who dance across the stage in mini cheong-sams and conical Chinese hats - not to mention a mini policeman, PC Pong, played with good-hearted humour by Phil Holden. There’s even balloon escapology which dazzled young and old alike and enthralled my cynical colleague Adam. Gary Wilmot steals the show as Widow Twankey. He’s a very saucy dame indeed and his scenes with the Emperor - Alec Guinness look-alike David Whitworth - are priceless, especially when he loses his wig accidentally . . . or on purpose? Former a1 frontman Ben Adams is a handsome Aladdin while Aimee Atkinson makes an impressive Princess Jasmine. As for Wayne Sleep and Priscilla Presley - all I could think about was their connection to two of the most iconic figures of the last century. Wayne - who famously partnered Princess Diana at Covent Garden - makes a merry Genie of the Ring (although his twirling days are long gone) and Priscilla is curiously immobile as the Genie of the Lamp (but she does have a wonderfully expressive voice). Fun from start to finish - and don’t miss the web cam at the beginning which gets everyone in the mood. Creagh would also like pay special tribute to the elephant. CARR SAYS... Who doesn’t love the magic of pantomimes? You can shout Scrooge at me for this one, but I love a good silly panto with all the right trimmings - perfects gags, outrageous dames and a camp sing-along to Christmas. We need to be absolutely clear on this point - MK Theatre’s Aladdin is not a patch on last year’s Peter Pan, which was among the best pantos I’ve ever seen. Sure, the production quality is there, the sets, costumes, dancers are all on a par with any other dazzling festive treat. But the problem with this is the script ... it’s awful. Slapstick jokes that fall so flat they don’t even muster enough of a groan to be funny. And it’s a pity because Aladdin on the whole is less than the sum of its parts. Ben Adams is a handsome Aladdin, and Aimie Atkinson is an enchanting Princess Jasmine with a singing voice to boot. The track listing could be a bit more exciting though. Yorkshireman Marc Pickering puts in a good show as the villain Abanazar – but the witty dialogue just isn’t there to help pull it off. Wayne Sleep and Kev Orkian provide the comedy value as the Genie of the Ring and Aladdin’s brother Wishee-Washee, but even they struggle with the turgid lines. And let’s not forget one of the novelties for the grown-ups – Priscilla Presley as the Genie of the Lamp. Just seeing the wife of Elvis probably outweighs the limitations of the Genie’s role, she says all of half a dozen sentences but hey, who is counting. Hats off however, to Gary Wilmot as Widow Twankey. At times hilariously bursting into unplanned laughter, that was one pantomime dame who knew when to ditch the lines in favour of ad-libbed fun with the audience. 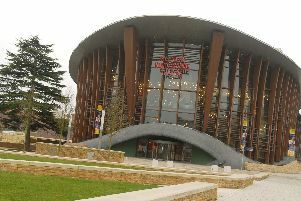 Aladdin plays at Milton Keynes Theatre until January 10. See here for tickets.